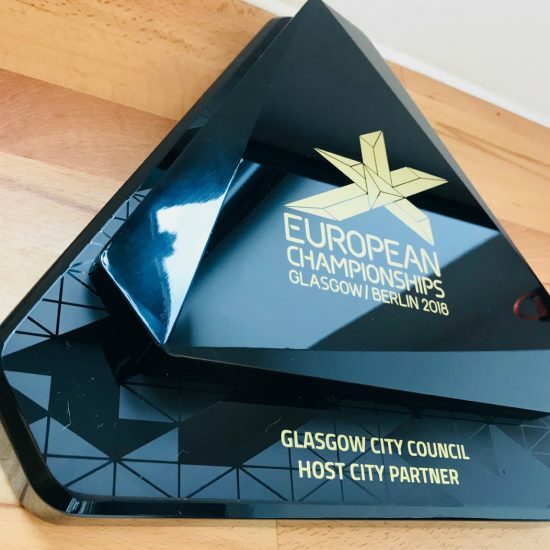 As part of the European Championships ceremonies programme, we were asked by European Championships Management to create a wall plaque to be presented to the Host Cities in recognition of their contribution to the Games. 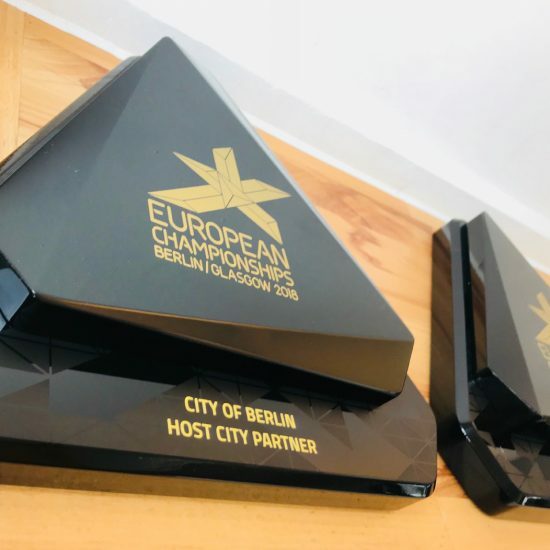 As part of the ceremonies programme, we were asked by European Championships Management to create a wall plaque to be presented to the Host Cities in recognition of their contribution to the Games. We chose to machine each plaque in two parts: a prism shaped crown mounted onto a triangular wall plate. Both pieces are machined from solid black acrylic finished to a high polish and held together using rare earth magnets. Unlike a typical flat commemorative wall plaque, this one has a dynamic 3 dimensional look to it designed to catch the light. The plaque can be displayed flat on a shelf or wall-mounted using concealed fixings. In all we produced 15 plaques each with a different graphic; 11 for Glasgow and 4 for Berlin. The base plate was over printed with a triangular pattern motif in a matt lacquer to create a subtle tiling effect.